Your computer files are your most valuable business assets and they need to be backed up all the time. The question is what’s the best backup medium to use? With so many ways to back up your computer files, cloud based backup is among the most recommended methods. Cloud based backup is also known as online backup. It is a technique of backing up data by sending them to an offsite server over a public network. The offsite server is normally hosted by a third party service provider who collects a fee from customers based on the volume of users, capacity and bandwidth. The recurring fee for housing your data or for the use of cloud backup services can be in the form of monthly plan or yearly subscription. The fee can also be based on the data transfer you use. Keep in mind that larger fees for cloud storage are accumulated when your data size grows. What are the advantages of cloud based backup? Many people consider cloud based backup with the most benefits. Affordable. This is the first consideration in any business or company looking for backup services. Cloud based backup is low cost and affordable depending on your data storage capacity needs. In fact, there are also available cloud services that are free. Accessible. You can backup your data and access them as long as you are connected to the internet. Cloud storage has more accessibility when home Internet connections increase in bandwidth. You can have access to your data anywhere and anytime. Flexible. When your data require more bandwidth, you can choose flexible plans to suit your storage data space. You even have access to countless volumes of storage spaces such that expandability can be achieved. Co-location problems are eliminated since your data are stored in a remote site. Secure. Your computer data are secure. They are stored on huge array of redundant hard drives which provide for reliable data protection. Researchers noted that human errors are oftentimes the main cause of loss of important computer files due to inappropriate server backup. With cloud based backup, this is eliminated as highly trained data engineers are managing the data servers. Reliable. Maintenance is not an issue. Cloud storage services have their reliable and automatic disaster recovery plans that can resolve issues faster than in-house maintenance. Which cloud based service to choose? A person relying on cloud backup services must also be concerned with the status of the company handling the service. When this outside company goes out of service, your stored backup data may be in peril that is why you still have to carefully determine the status of shortlisted companies providing cloud backup services. You must not forget to categorize yourself either as a medium data user or a very large data user before choosing a business or enterprise plan that would cater to your needs. 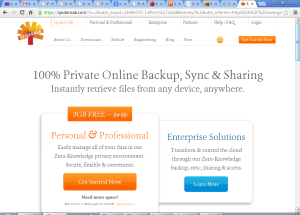 Are there free online backup services? There are a number of free online backup sites or services that will save your files offsite to the cloud. Data storage in the cloud is considered one of the fastest ways of recovering and archiving computer data and free service is a total relief especially if your budget is running low. Some notable online data storage and backup sites are Idrive, Google drive, Sugarsync, Spideroak and Skydrive to name a few. Here are a few things you need to know about each for a starter. The parent company of Idrive is Ibackup which has been in business since 1999. Google Drive has a 15 GB online storage and is obviously part of Google which is an established company. Spideroak has end-to-end encryption while Sugarsync offers 5 GB free. Skydrive of Microsoft offers 7 GB of storage space for new subscribers. An old subscriber is entitled to 25 GB of storage upon consistent usage of this amount of storage space. Find out about backing up your data to Seagate Central cloud.